Photo of: West of Ireland: West Cork: Bantry Bay. 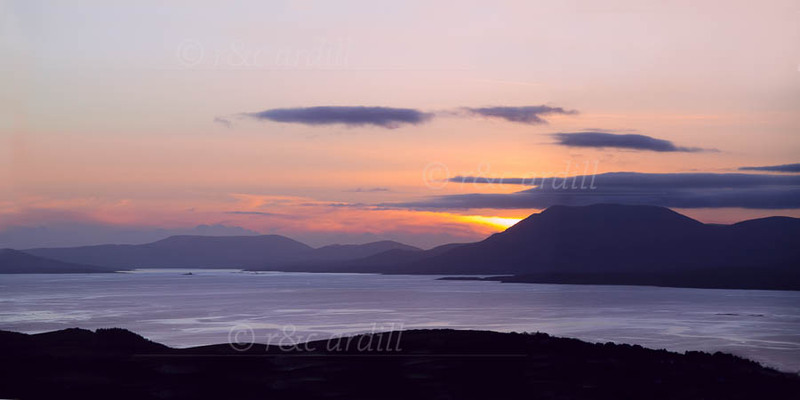 View of Bantry Bay from Sprat Hill at sunset. A cloud hangs over Hungry Hill, the highest peak on the Caha Mountains. The other peak in the distance is Knockgour, part of the Slieve Miskish mountains. Both peaks are on the Beara Peninsula. Bear Island can be seen at the far left and Whiddy Island on the right.